The scientific name for Ginger is Zingiber officinale. 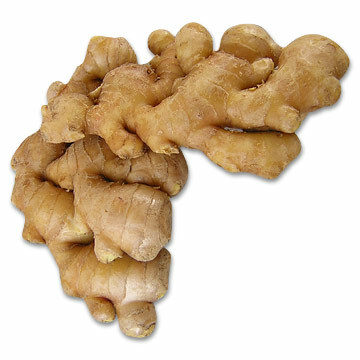 Generally speaking, Ginger does not go by many other names than perhaps occasionally, African Ginger. The parts of the Ginger herb that are used medicinally are both the roots and the rhizomes. The ginger plant was introduced to the Americas in the early part of the 16th century by the Spaniards. Ginger became so popular among Europeans that in 1884, Great Britain imported over 5 million pounds of the root. Generally speaking, Europe is further along in their acceptance of these potent, healing herbal substances than North America. Research conducted at Cornell University Medical College has found that Ginger may help to prevent strokes and the hardening of the arteries. This active ingredient of Ginger, Gingerol, has been proven effective in preventing recurrences of so-called "little strokes". It is believed that this substance, Gingerol, inhibits an enzyme that causes cells to clot. It is therefore useful in many ways. Aspirin has currently been lauded medically for its blood thinning properties, which help to prevent heart problems. What has not been addressed, however, is the fact that the aspirin has serious side effects such as causing stomach and intestinal ulcers, which often hemorrhage causing death. It is also said that aspirin blocks Ginger's action to prevent blood platelets from clumping. So although Aspirin can prevent the clotting that prevents strokes, it also prevents Ginger from naturally doing a better job of preventing harmful problems. Obviously, the two combined do not work as successfully together. Ginger has been known to fight inflammation, cleanse the colon, reduce spasms and cramps, and stimulate circulation. Ginger has many uses; for instance, it's used as a strong antioxidant and effective antimicrobial agent for sores and wounds. It also protects the liver and the stomach. This potent herbal substance is also useful for bowel disorders, circulatory problems, arthritis, fever, headache, hot flashes, indigestion, morning sickness, motion sickness, muscle pain, nausea, and vomiting. Interestingly enough, some cautions should be considered. For instance, Ginger can cause stomach distress if taken in large quantities. Also, Ginger is not recommended for people who take anticoagulants or who have gallstones. It is not recommended for extended use during pregnancy, as well. Bodily Influences of Ginger: Analgesic, antacid, anti-emetic, anti-inflammatory, antispasmodic, aperitive, aromatic, carminative, diaphoretic (if taken hot), diuretic, emmenagogue, nervine, rubefacient, sialagogue, stimulant, stomachic, tonic. Ginger thins the blood and lowers blood cholesterol. It is known to work to reduce fevers. It can be used to relieve vomiting and to soothe the stomach and spleen in the process. Ginger is a warm blood vascular stimulant and body cleansing herb and is used in respiratory and lung-chest clearing combinations. It is alkalizes the system and is used as a stimulant of the digestive system. It is a catalyst in nervine and sedative formulas. It has a variety of uses such as in a gargle preparation and as part of sore throat syrups. It is used as a diaphoretic, encouraging profuse sweating which helps with the removal of toxic waste. It is a kidney stimulant to increase kidney filtration. Ginger has a reducing effect on migraine headaches without the side effects found with drugs. Be sure to drink a lot of water to avoid dehydration headaches. Ginger has also been found effective in combating nausea caused by motion sickness. This herb is most often used as a carminative, usually mixed with a variety of other herbs. It has a great ability to stop griping and cramping, especially in the abdominal and intestinal area. Ginger has long been recommended by herbalists to aid with blood cholesterol because of its ability to improve blood circulation, especially to the extremities (hands and feet). Because of Ginger's great effects on the blood, it is also very useful in hemorrhoid cures. In China, Ginger is used in the first stages of the common cold. With the stress and strain found in modern women, Ginger is remarkable in alleviating menstrual cramps. It has been found to be effective in arresting excessive menstrual flow and to increase the flow of urine, when taken as a hot infusion. GINGER IS ALSO BENEFICIAL DURING PREGNANCY: IT IS EXCELLENT FOR MORNING SICKNESS AND HAS LOTS OF MINERALS. Alpha-pinene, beta-carotene, beta-ionone, beta-sitosterol, caffeic acid camphor, capsaicin, caryophyllene, chlorogenic acid, citral, curcumin, farnesol, ferulic acid, geraniol, gingerols, lecithin, 1, 8-cineole, zingerone. Nutrients: Amino acids, calcium, essential fatty acids, iron, magnesium, manganese, phospohorus, potassium, selenium, zinc, vitamins B1, B2, B3, B6 and C. Ground ginger also contains vitamin A.